Acorn Granite, Marble, & Soapstone is a Chicago based full service stone contractor for commercial and residential clients. We control the entire process from stone importation to stone installation and provide a variety of services to customize and improve interior and exterior spaces. 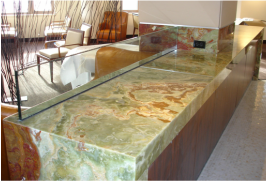 Additionally, we work with a diverse range of common and rare stone that include granite, marble, soapstone, quartz, and limestone for your custom countertop installations, flooring, and exterior projects in the Chicago area. We prepare granite, marble, and soapstone kitchen countertops, bathroom vanities, and bar top installations. We create beautiful, unique stone floors for small and large spaces. We are experienced with exterior stone work and offer services such as stone paving and wall cladding. Since 2001, we have imported, cut, polished, and installed granite, marble, soapstone and more for a variety of projects that have ranged from kitchen countertops and backsplashes in residential high-rises to retail exteriors. Our skilled employees use high quality tools to ensure that we deliver a product that guarantees client satisfaction. We use state-of-the-art fabricating technology to ensure that your stone is precisely crafted. Our employees are trained to use our CNC, CombiCut Waterjet, and Bridge Saw machines to precisely fabricate a variety of material. Additionally, we rely on our Edge-Polishing and Surface Finishing machines to further customize stone according to our clients' preferences. Whether you're a first-time home builder, designer, or contractor, we will help you through the entire process to ensure a beautiful interior or exterior. We aim for total customer satisfaction in all our projects. We are happy to answer any of your questions, concerns, or comments. Using the finest granite, marble, and soapstone materials, We provide the highest quality stonework and service in the Chicago area.